Features children, ages 2-8, involved in activities in the community. It is designed to familiarize children with locations that may be challenging, and to help teach appropriate behavior in these locations through peer modeling. Each scene lasts between 2-4 minutes, depending on the chapter. Includes Doctor; Mall; Birthday Party; Hairdresser; Dentist1; Dentist 2; Grocery Store; Transportation; Library; Playground; Restaurant; School. At the end of each chapter is a storyboard summarizing the locations shown. 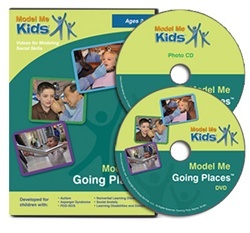 Developed for children ages 2-8 yrs. with autism, Asperger Syndrome, PDD-NOS, nonverbal learning disorders, social anxiety, and learning disabilities & delays. Kit contains the DVD (42 min), CD-ROM and song lyrics. IL Pres-3.